Visual and performing arts are offered as electives at all St. Johns County School District high schools. Courses offerings may include visual arts, chorus, instrumental music/band, drama and dance; however, not all courses are taught at all schools. Students who are interested in pursuing an Arts Program of Study can apply to the St. Johns County Center for the Arts (SJCCA) at St. Augustine High School. 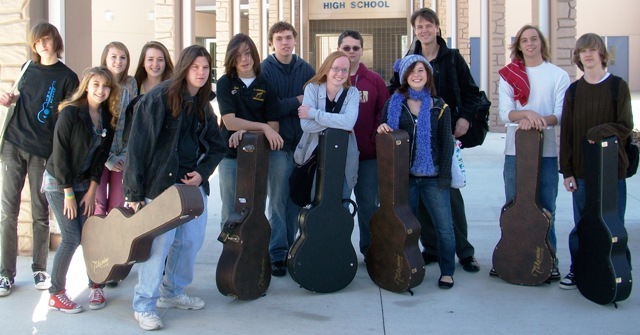 SJCCA offers Chorus, Musical Theater, Drama, Dance, Guitar, Piano, Marching, Jazz, and Concert Bands, 2-D, 3-D, and Digital/Computer Art. Dance is also taught at Bartram Trail and Pedro Menendez HS. IB, AICE and AP Art History is available at some schools. Students who are not zoned for St. Augustine High School must apply to attend SJCCA at SAHS. Students in the performing and visual arts programs participate in many community events, including local and regional fairs, parades and festivals, competitions, and showcase performances. The St. Augustine Art Association hosts an annual juried All-County High School Art Show each March, with awards for outstanding visual art. Students participate in annual visual arts showcases, like the North Florida Scholastic Art Awards, Art Works, FAEA Virtual Exhibit and others. Students can also compete for awards in the 7th Judicial District’s Crimestoppers Poster contest and the Betty Griffin House “Day Without Violence” art contest. Applications for SJCCA are available to rising 9th and 10th grade students. Information on and applications for SJCCA will be available on the St. Augustine High School website at the beginning of the Spring semester. For more information, call 904-547-8530 or see www-sahs.stjohns.k12.fl.us. The SJCCA website is www.sjcca.org.